Hey, beautiful people! It's summer, so I am going to try my best to do recaps of my wash days again. My sister is visiting for a couple weeks, and she brought products from Shea Moisture's Jamaican Black Castor Oil line with her, so I decided to try them. I previously reviewed the edge treatment here. For this wash day, I forgot to deep condition beforehand again; so, my wash day just started off with a shampoo. I washed my hair in four sections, shampooing and then detangling each section with conditioner. 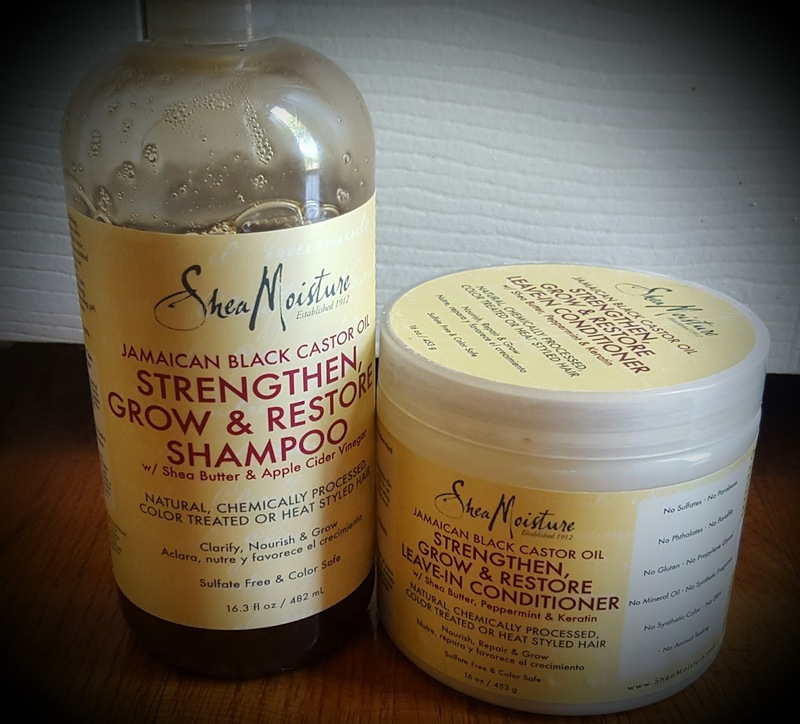 I used the Shea Moisture Jamaican Black Castor Oil Strengthen, Grow and Restore Shampoo and my Herbal Essence Long Term Relationship Conditioner. The shampoo was not bad and not good, just ok. It did not leave my hair feeling stripped, but I didn't necessarily feel like my hair was clean either. Also, my eyes itched a little while I was washing my hair, but I can't say for certain that it was the shampoo that did it. I would need to try it gain to be certain, and I don't think I'm going to try it again. After my shampoo and condition, I dried my hair lightly with a regular towel. Yes, I know this is a no-no in the curly girl bible, but I just scrunched my hair, making sure I didn't rough up my cuticles. 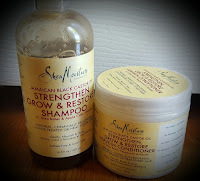 Next, I put in the Shea Moisture Jamaican Black Castor Oil Strengthen Grow & Restore Leave-In Conditioner. This leave-in conditioner is surprisingly light, especially because it is in a jar. It is the consistency of a very thin lotion. Because it is so light, I was worried that it would not be enough, so I also used Camille Rose Almond Jai Twisting Butter. Then, I put my damp hair in two cornrows to dry.